A live art excursion into the wilderness of the throwaway society. 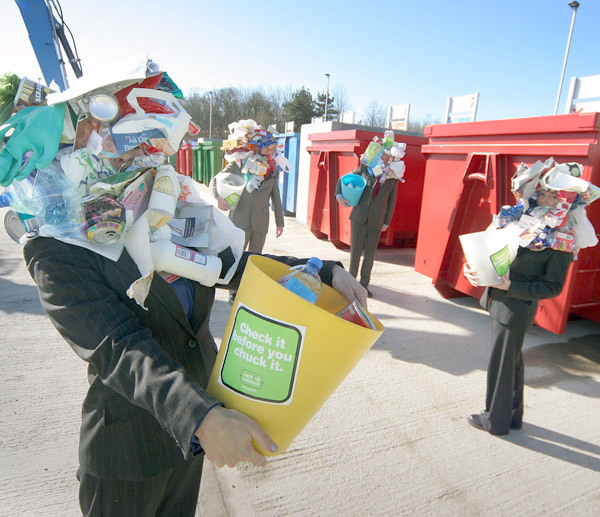 Smartly suited performers with heads covered in rubbish, drop litter and decorate the ground with tin cans, plastic bottles and packaging – and then pick up the pieces. Balletic, wistful, and engaging, the mysterious repetition of clearing up and throwing away causes embarrassment and laughter in equal measure. An audacious attempt to create high art from low level rubbish and perfectly suited to be part of any environmental based event or recycling campaign. A meditation on the idiocy of our over packaged world.